Busy, after working in busy days, busy weeks, need a holiday….?? Here, we would like to offer you for your next vacation in Java and Bali Island – Indonesia. 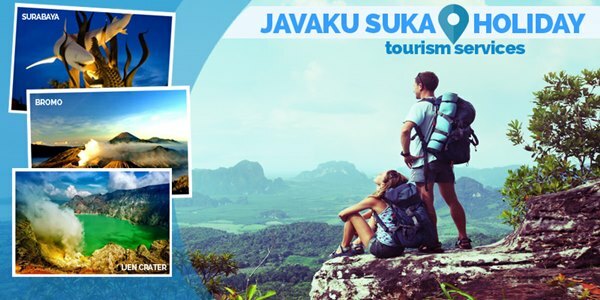 JavaKusukaHoliday is one of the best tourism service which is help you to arrange and make itineraries for your vacation with us. Just please let us know what do you want or get or request for your next vacation especially in Java-Bali Indoensia, our great team will do a quick response to give lot of list of plan and the best solution, so can help you to plan your vacation in Java-Bali, Indonesia. Our friendly teams will be happy to arrange the transport, hotel, and your holiday destination here. We have many programs such as adventure, heritage, culture, culinary, leisure, shopping, pedicab, and others kind of tour package that others can’t give to you. We serve backpackers, adventures, rafting, paragliding, beach as well. Java Kusuka Holiday tourism service, serve for East Java, Central Java, Bromo Tour Mountain, Ijen Crater, Bali Island Trip and other (as your request). Java Kusuka Holiday is a group of licensed Tour Guide also with experienced more than 9 years, so we know how to serve our clients. A group of Tour guide who join us are a local people who know the favorite food and places for tourist. Our most purpose is satisfaction of our clients, we do not offers the tour packages, but we offers the flexible journey. You will be picked up by our guide at airport, railwaystation or hotel ( Surabaya area ), then transfer to your chosen hotel near the mountain. Check in and free program. Early wake up in the morning, our guide will accompany you to Mt. Pananjakan by 4×4 Jeep to see the sunrise. While you are waiting for the sunrise, you could have a cup of tea or coffee just at the mountain. After sunrise, go down to Mt. Bromo, passing through sea of sand. From the jeep parking area, then walking up to Mt. Bromo. Find our others Tour Package and send your chosen tour request. We serve tour package for private, group, and family trip. For further information, would you please to contact us via e-mail, WhatsApp, BBM, or by phone. Our team would give you quick response of the best solution for your flexible trip with us.